You are here: Home / Engineering Toolbox / Need Both High Channel-Count and High Accuracy? MEASURpoint Is the Tool for You! 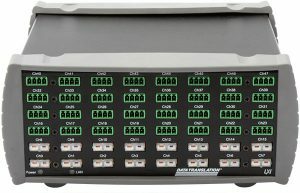 When it comes to high accuracy measurements, most DAQ devices can provide reasonable measurement accuracy for one type of measurement, and some can handle a mix of temperature and voltage sensors if the number of channels needed is low. For applications needing 8 to 48 differential channels, top-notch temperature and/or DC voltage accuracy, and zero channel-channel interference, the DT MEASURpoint family fits the bill. MEASURpoint’s 500 V channel-to-channel isolation ensures data integrity by preventing ground loops and increasing common-mode rejection. Channel-channel interference is virtually eliminated due to per-channel signal conditioning including a CJC sensor for each thermocouple and a current source for each RTD, and per-channel measurement hardware including a 24 bit sigma-delta A/D converter and DC/DC converter. The resulting K-type absolute accuracy, for example, is a remarkable +/- 0.38 °C over a wide -100 to 1100 °C range. One application requiring precise temperature and voltage measurements is the testing of lithium-ion batteries used in products such as laptops, cellphones, and power tools. MEASURpoint’s analog input channels can be configured for a variety of input ranges from millivolts to hundreds of volts. Therefore, the temperature levels of the batteries can be precisely monitored, without impact, during both charging and discharging. Properly characterizing these attributes is important for safety-concerned manufacturers since the batteries will be used by consumers across multiple markets, and MEASURpoint provides these customers with the best tool for the job.